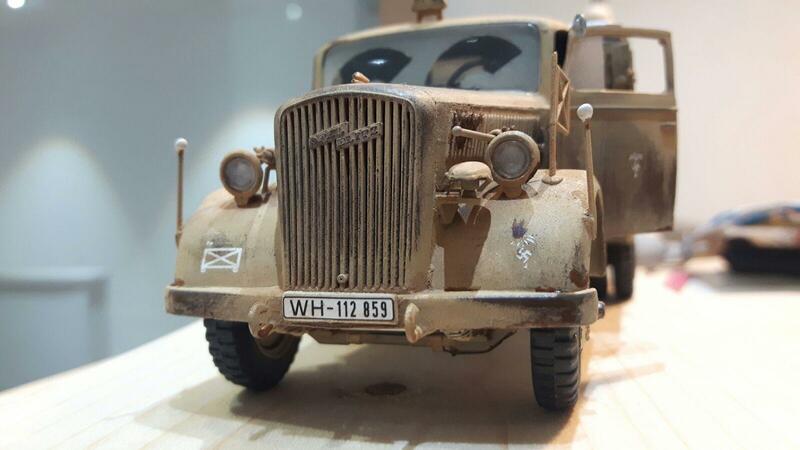 The Opel Blitz was one of the main workhorses of the German army in WWII with over 80.000 pieces built in many different versions. This truck had a max loading of about 2 tonne on leaf suspension and was featured of a 6 cylinder in-line petrol engine. This kit by Italeri dates back to the seventies and was reboxed in this version in 2003. You can tell that the kit lags behind on the level of detailing newer makes have to offer, but as a secondary vehicle to the planned dio (the Tiger 1 being the main act) I thought it was fine to build it OOB with some after detailing. This kit is actually quite basic, but since I intend to embed it into an Africa 1943 setting, I did some after detailing and researched the correct color scheme and markings. All went well with a little help of my friends here :). The build is rather detailed in the above Kasserine thread, so I refer there for further details. I meticulously planned the painting steps so to simplify the later weathering steps. Many German vehicles were shipped to Africa via Italy in the original – often plain German grey – color scheme. Over there they were painted with the available paint so to fit the sandy surroundings of the desert. 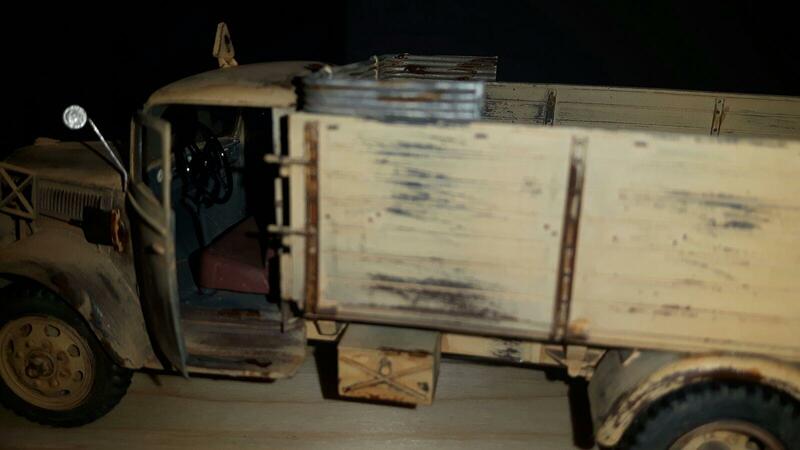 Therefore, the German grey layer came first, followed by a rusty brown on metal parts of the vehicle (chassis, cabin and on load tray strappings). 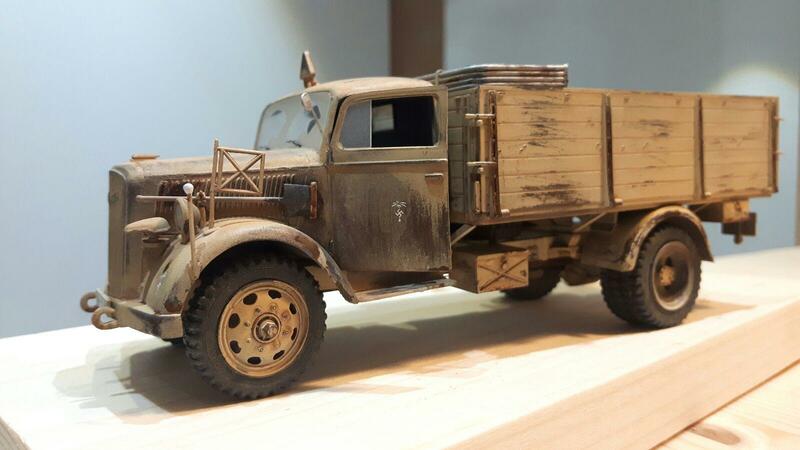 A generous layer of hairspray followed by a mix of Revell enamels mimicking the “Afrikabraun” typical for DAK vehicles in the early 1940-ies. 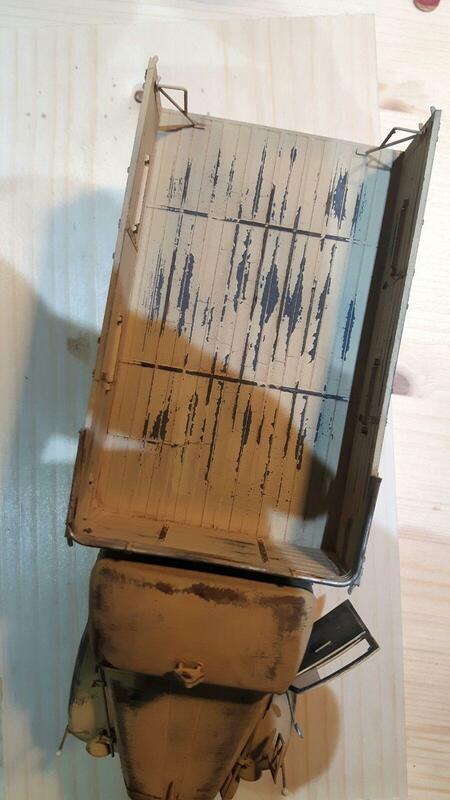 When all that set, I rubbed the top layer off here and there to expose the German grey and rust colors. I like this kind of chipping because of its simplicity in terms of steps and universal use. Just rub-off paint there where multiple years of exposure to the elements led to paint chipping off. No two vehicles treated in this way will be the same! As a final step, I applied a brown filter made of thinned oils and added some (real) rust here and there, especially on the exhaust. The decals are a mix between the ones featured with the kit and Archer fine dry transfers. This vehicle will be placed into a diorama together with an early Tiger I of the 501st heavy tank battalion at Kasserine. With help of some figures, the reloading of the Beast will be featured. The dio will take form once the Tiger is finished. What do you think of it? Now, here comes the Tiger… Stay tuned! Stunning build. Well done there. I like the way you planned your paint job to enable earlier coats to come through. Applause to you. Your painting plan has worked a treat, it has really brought this everyday vehicle to life. Well done Michel, your dio already has a great start. Can’t wait to see that Tiger. Fantastic, a true benchmark when it comes to weathering. To see it with the Tiger…I’m very excited! Thanks for joining the GB, Michel, and (shameless plus here) there’s still time for more entries since the overall reveal is late February and the project runs through the end of May. Michel, your Blitz is superbly done ! The painting plan & prep were “just the ticket’ to a wonderful truck. I can’t wait to see the overall end result. Michel, this is just stunning. The whole build has been a bit of a lesson, and compelling viewing. And it has happened so quickly! The weathering is just sensational. Thanks for sharing – can’t wait to see it all come together! Lovely build that! The weathering is really convincing. Michel, a very nice looking model, love the wear and weathering you put on this, it gives a very realistic look. Well done ! My compliments. What a realistic finish on this truck. Bedankt Dirk! Als je eens in de buurt van Waregem bent altijd welkom! Excellent Michel! Love the weathering and detail work. Fantastic work Michel! I’ve been away for a while so I have a lot of catching up to do. You’ve done the old Opel proud, and it’s great that you’ve discribed your work progress on the colours and weathering. beatiful build and outstanding wheathering my friend. I am loving the windshield. Sweet!